It is with a heavy heart that I write you. I must inform you that the deadline for a bill to be put on the House Agenda for the floor expired last night at 10pm. While HB 81 did make it on to the agenda before the deadline, HB 2107 did not. This was due to the paperwork not being completed for it’s enrollment in calendars with enough time, completed less than 3 hours before the deadline to be placed on the agenda. With no special Calendars meeting called to hear it’s addition, HB 2107 was not able to progress and is no longer a viable option in it’s form. 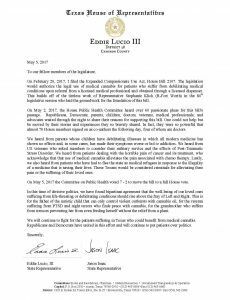 However, it’s two main authors, Rep Lucio III and Rep Isaac, have promised to continue to look for avenues to codify protections for patients as this legislative session continues. You can also read this touching letter from them. Texas NORML will diligently support any attempts made to enact protections for patients in the upcoming weeks. Our thoughts are with the many patients, caregivers and practitioners in the state that are effected by this disappointment. Times like these are very difficult and we are all still working to process this. With that in mind, I would like to share some silver linings that have come from the historic actions taken to enact HB 2107 that I hope help soften the blow. Texas has never previously held a committee vote on a whole plant medical cannabis bill. We were able to hold our most powerful and effective hearing yet which ended in a 7-2 vote that we know have on the record for the first time. It is also remarkable to note that the Chair put the bill up for a vote out of turn and knowing he would vote against it. This is not a regular occurrence. A historic 70+ legislators signed up as coauthors on the bill in the 36 hour periodafter the hearing. 28 of those were Republicans. 4 of the 5 Doctors in the Houseare also included in the coauthor list. We have gone from a handful of legislative supporters to unprecedented numbers! Numbers that would have given HB 2107 the votes to pass. So we must diligently work to keep each one of these allies. With that many legislators vested, safe access to medical cannabis becomes a significant campaign talking point. It will be important the we check back in on the basics when the interim begins and prepare for the most important campaign season of medical cannabis’ history. We will of course have a new Texas NORML Marijuana Policy Voter Guide and Voting Appendix. Please take a moment to CALL or EMAIL your support for HB 81, so that we can work to remove the criminal penalty for possession of one ounce or less! It is imperative that we accomplish this by midnight on Thursday, the day the bill is scheduled. The problem is the law, not the plant. Thank you Jax, and thank you Representatives Lucio and Isaac; these are letters representing the best of the American spirit, bipartisan “patients before politics” and an awesome example of how to reform marijuana laws in a state without voter initiatives. We would not have made it this far without you. You are the influencing force of love for your loved ones that galvanized our Representatives, our DA’s and our fellow Texans into action. This is no time to feel discouraged, and there can be no surrender to political despair. Even if the Texas Compassionate Use Program in its current form provides no relief to you or your loved ones, sign up if you qualify. Representative Isaac passed amendment HB7 through the House on Monday to prevent CPS from prosecuting parents who are following the rules of TCUP. Meanwhile if we can get HB81 passed with or without Abbotts signature, whats a little civil disobedience if some more effective concentrate with more THC ended up under the tounge? More than half of the Texas House of Representatives cosigned HB2107 after that hearing. Thats no small achievement. If Texas makes history today and decriminalizes small possession of marijuana to a $150 fine and no criminal record that will be because of patient advocates that did not give up no matter what the odds. No matter what happens today on HB81 I could not be more proud of what was accomplished in that hearing May 2nd. And you know what? The majority of the Texas House is too! God bless all you refugees; Texas, lets bring them home!!! I came of age during a time (mid-seventies) when marijuana legalization seemed an impossible hope. Reefer-madness was status quo, and while it was as obvious as ever that the emperor has no clothes, prohibitionists were comfortably in power, and dissent was easily ignored. So, I feel your pain, and your frustration, because your cause is my cause. I do know the feeling of being voiceless and powerless against a gigantic lie. But do not lose hope. My alienation began to yield to hope when California legalized medical, many years later. Then I found myself at “ground zero” when Colorado legalized. I participated in that effort as well. So, in retrospect, I’m really glad I continued to support legalization, even though it seemed hopeless at one time, and I paid a socio-economic price for it,as well. Let’s take the long view for a moment — the truth will prevail. I give you kudos for staying in the fight, helping our cause, even tho you already live in a land of freedom, Colorado. You are the antithesis of the selfish. I don’t claim to be a big player in the movement — I’m not. The payoff was personal, and relates to my personal perception of the nature of the society we live in: a free democracy, or a fascist police state? These days,with Trump firing anyone who threatens his power, I would say fascism. But I’m armed with the hope that comes from what I’ve seen to be possible, and my intention is just to offer encouragement. The quote above is the generic reason why HB 2107 will not be voted on. The obvious “elephant in the room” questions are: Why was the paperwork for HB 2107 not submitted in time? Was this a procedural error? Was this a form of sabotage by someone who did not like the bill? Did the paperwork fall behind a filing cabinet and was discovered too late to make it? Someone knows the answers to these questions. Why not come clean with the real reason(s)? Leave it to marijuana policy and the way we cut our limes to determine a legislative schedule. The other side of this dirty coin we call a Democratic Republic is “ask not what marijuana policy can do for you but what you can do for marijuana policy.” In other words, its up to us… ALL of us… to get in our Reps faces and push our legislation forward. Its Democratic Republican legislation with a lime twist… as in go twist their arms with the TRUTH!!!! The fact that 70+ legislator (including 28 GOPers!!!) signed on as coauthors shows the great work being done by NORML (including you, J.). It also is proof that the cracks in hardass red states such as Texas are possible, and indeed beginning to happen. As I stated in another post to you HB81 and HB2107 arent “dead” yet… Representative Isaac is going to try and pop them into an amendment over the next two weeks. He was already successful with one amendment, HB7, to keep CPS from prosecuting parents complying with the TCUProgram. With more than half of the House in favor of HB2107, the moment to strike an amendment will be a surgical move of precision. I still L O V E the state of Texas! It will be so totally awesome when Texas legalizes. Keeping reintroducing this legislation. It isn’t going away, you prohibitionists. Why wait any longer? The state can always use the money so legalize both MMJ and adult recreational all at once. Very sad….even more sad for those patients :(…..TheOracle is right it is NOT going away, however…..the proverbial genie is out of it’s bottle. Keep fighting, Texas….Make your voices and the voices and pleas of patients heard, as well. Lucio III is ruining medical marijuana in texas. He wants smoking to be banned if you smoke its not med use. He wants no home growing thats enough to ignore his bills. He wants only terminal cancer autism multiple sclerosis and Parkinsons thats it as “debilitating medical conditions” how bizarre is that? We definitely need issac to write the next bill lucio is a corporate shill.